So you are a student in a college or high school poetry class. You have no idea what is going on. The teacher gives you a poem to read. You read it. You are baffled. Then the teacher does one of two things. He or she carefully guides you through layer after layer of obscure sentences and images, taking them apart and then piecing them back together as if the poet had cut them all up with a word-jigsaw to make a puzzle that the professor is showing you how to fit back together so you can see what the poem “means.” At the end you think, if that’s what the poet meant, why didn’t she or he just say so in the first place? Or, the teacher starts talking about things that seem to have nothing to do with the words you just read. How the professor got this mini-lecture out of these words is like being in court and having no idea why your lawyer is telling you to plead guilty even though he knows you didn’t do it. As far as you can tell, poetry, like the law, is utter nonsense. You just want to know what the fine is, pay it, and get out of there. The reason poetry seems as bewildering as a legal system is that it gets treated in class as if it’s a word puzzle that has to be solved to be understood. But here’s the thing: Even though you and often your teacher want to treat poems like obscurized intellectual statements, they’re not. Not in their origins, anyway. Decent poetry is not speaking primarily to your rational, intellectual brain. Poetry is speaking to whatever it is in you that recognizes meaning in music, or humor in a joke. The footnotes to the poem with no words are all explaining nothing! The “meaning” of this poem is the laugh you get out of it. It’s satirical, meaning it’s evoking a particular irony (in this case, explaining in great detail something that doesn’t exist). Irony, it’s important to note, is not a thought, but a feeling you get when words or events call attention to an uncomfortable contradiction. The irony in this poem is that it’s all mini-lectures and no poem; an uncomfortably funny, sort of emperor’s-new-poem poem. Irony can also give you feelings of tragedy, hypocrisy, suffering, payback, nausea and more. stayed up with them till morning light. Mother, I don’t like your being dead. You were so vibrant, funny, wise. than anyone I ever knew. The feelings you get are the meanings. Those feelings can be pure and simple, or they can be quite complex, depending in part on the complexity of your own complexities. In the title poem, it turns out that God (William Blake’s old “Nobodaddy”), who doesn’t exist, doesn’t like beer. Or Ted, either. Ted Bookey has taught in the Senior College at UMaine Augusta, and his books include “Mixty Motions” and “Language as a Second Language,” among others. He and his wife, Ruth Bookey, organize the Bookey Readings at the Harlow Gallery in Hallowell, where they will be hosting readings by students from Winthrop and SAD 11 in association with their Poetry Out Loud projects, starting at 7 p.m. Friday, April 13. I feel like the kids are in good hands. 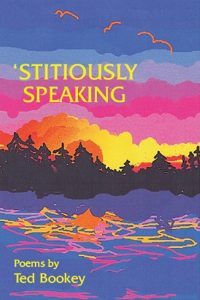 “‘Stitiously Speaking” is available from Moon Pie Press.